Sestri Levante is a most beautiful little town on the Ligurian Coast. You can picture it by thinking of a larger version of Portofino. Its proximity to the A12 motorway – which does not, however, intrude in any visual or audible manner – means that it is readily accessible to those of us who like to motor in France and in Italy near the Mediterranean. Having found it, I am slightly shocked that my discovery of its charms was not made long ago. The prettiness of the seaside setting is enhanced by the discreet symmetry of the architecture. Colourful harmony is all around. This is a place one likes immediately – once one has negotiated the highways of the modern town and reached the quaint streets and promenades of the Old Town. And looking out over and above this gorgeous scene is a charming hostelry, the Hotel Vis à Vis. The founder of the establishment was Giacomo de Nicolai. 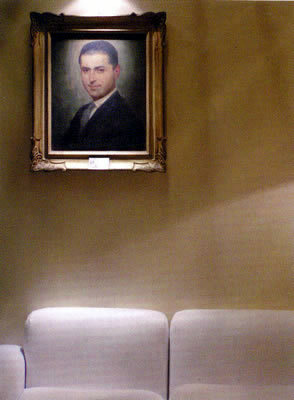 His portrait (pictured) adorns the entrance hall. Mr de Nicolai was fascinated by the great luxury liners which used to cross the Atlantic, taking the cream of European society to the New World. Therefore, when the opportunity arose for him to erect his own hotel to his own design, on a splendid vantage point high above Sestri Levante, he determined that the building should be “a ship on the mainland”. The floors would be ‘decks’, and the interior decor would remind the guests of those liners he loved. This was in 1961. 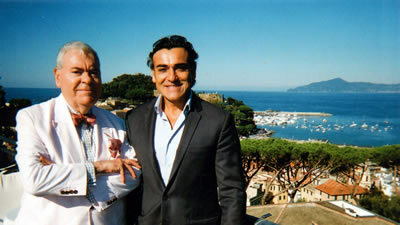 Now, the hotel is owned and managed by his charming grandson, Nicolò Mori (pictured, with your correspondent), who is careful to maintain the standards and ambiance of his remarkable grandfather. Of course, in one respect, those standards are easy to maintain, for the magical views have not changed. They still gladden the heart. 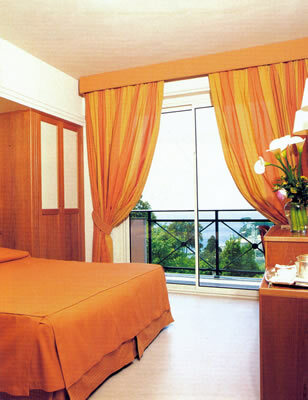 But an hotel is more than views, and the Vis à Vis has many other features to commend it to the discerning traveller. 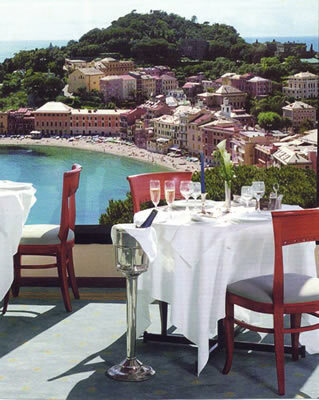 The high position might suggest that it is hard to reach the historical centre of Sestri Levante. 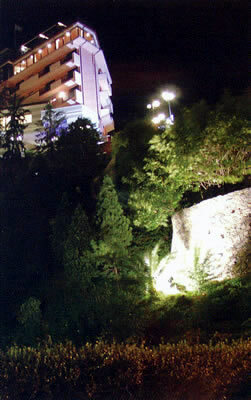 But not at all: the hotel has a lift which whizzes one down to just a few steps away from the heart of things. I used this often, and even my aged legs took me in no time to the water’s edge. Something else I used often was the light-filled drawing room on the Mezzanine level, which was full of comfortable sofas and oil paintings. It also had a grand piano, which somehow made me even more inclined to think I was on a ship. My own (air-conditioned) apartment was on the second floor. Number 215 was a Junior Suite, and therefore 229€-500€ a night, bed and breakfast for two, according to season. Its colour scheme included white (for the walls), brown (for the woodwork) and gold (for the curtains and the upholstery). On the walls were framed black-and-white photographs of Sestri Levante in the 1920s. As on a ship, a lot was packed into a little, although well-placed mirrors helped to increase the sense of space. The sitting room was triangular and contained a sofa. Beyond its sliding window was a balcony, from which I could survey the port below and the bay beyond. In the bedroom were fitted wardrobes and a safe, as well as a second sliding window to a second balcony (with a view over the modern town). I dined in the hotel restaurant on the fourth floor, the Ristorante Olimpo. Here the view was once more dominant, but the white napery, white crockery and glasses by Rasta (a German firm, new to me) added the proper sense of a serious culinary endeavour. Here I was looked after well by the Maitre d’ Maurizio, the Sommelier Nicolo, and waiters Valentino and Christiano. Chef Andrea Rossi’s cuisine is straightforward and tasty. A set menu of the day is offered for 40€, and two four-course tasting menus are available for 65€. I liked the look and combination of the variety of stuffed vegetables which began my dinner – served, as all food should be, on a large, round, white plate. The gnocchi with tomato, basil and mozzarella was decent, too, and set me up for a lovely, tender veal fillet mignon with gratinated potatoes. I finished on a high note, with a really excellent (and large) version of tiramisu. The wine list has 164 offerings. All, except the champagnes, are Italian. Prices are friendly, running from 20€ for a local white to 280€ for 2005 Cristal champagne. Other bottles to catch my eye were: Krug Grande Cuvée (190€), 2009 Ornellaia (180€), 2011 Sassicaia (210€), 2012 Tignanello (90€) and 2008 Cervaro della Sala (65€). Proof that you do not have to spend a lot to drink really well from this list came in the form of a bottle of 2011 Piedmontese nebbiolo. For only 30€, this yielded a full, fruity nose and in the mouth was deliciously hot and intoxicating (Gatinara, 2011). While you are at Vis à Vis, you should follow my example and pay a visit to the other restaurant owned by the family – the Ristorante Portobello, right by the water’s edge in the smaller of the town’s two ports. The setting, outside on the terrace, is enchanting. And the food, brought to the table by young chaps in sailors’ (or pirates’) costumes, is admirable. My armchair had been covered with soft cushions to accommodate my ailing back, a kindness which I much appreciated – as I did the splendid dishes which were set before me. Fish is the speciality, as you would expect, but before tucking into some simply grilled shrimps (super, when I squeezed a quarter of a lime over them), I devoured a portion of eggplant flan with Parmigiana. This rich flavour sent me straight back to the days of my childhood, and tucking into Auntie Maud’s rissoles. (And this, by the way, is a considerable compliment.) Showing that the kitchen was as expert in dealing with meat as it was with fish, was my beef fillet, admirably accompanied by porcini mushrooms and pecorino cream. My concluding ‘deconstructed’ zuppa Inglese kept up the high standards. Another red of ripe, hot, black fruit satisfied my desire for good wine (Niccolo V, Colli di Luni, Riserva, 2009). Back at the hotel, it was difficult to concentrate on breakfast with the view providing such a captivating distraction. Still, I did manage to survey the buffet to some serious purpose, taking to my table comestibles of high quality – most notably, slices of madeira cake, croissants, pain aux raisins and dishes of strawberries, raspberries, melon and pineapple. From the kitchen were brought to me lovely onion omelettes, freshly-squeezed orange juice, silver pots of coffee and plates of the most delicious Parma ham. In the midst of all this excellence I thought two small details required attention – the inferior cereals (i.e. not Kellog’s) and the paper napkins (i.e. not linen). But I am sure Mr Mori with soon deal with these tiny blots on his escutcheon. 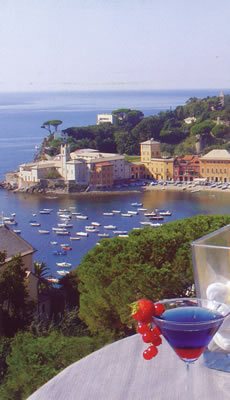 Sestri Levante is a beautiful own, and the Vis à Vis is a very good hotel. I commend them both to you. You will be disappointed by neither. Via della Chiusa 28, 16039 Sestri Levante – Genoa, Italy.